Pro-Grow All Purpose Plant Feed is an organic sourced NPK 12-9-9 granular slow release fertilizer made entirely in Britain. 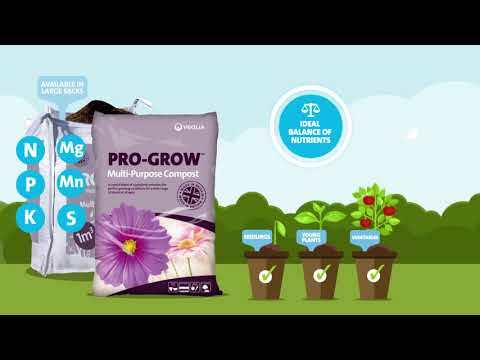 Rich complete balance of major nutrients and trace elements that improve the overall fertiliser efficiency. Apply prior to sowing and planting or use as a top dressing for established plants, blending with 20 cm depth of the soil/compost. Apply once between spring and autumn leaving at least six months between two applications. Apply 20g per height/branch meter and mix around the base (1sq. metre) avoiding roots. Apply 15g/sq. metre evenly distributed over the vegetable plot and work in well. Sprinkle 20 g/sq. metre spread evenly over the surface area. As for all products of this type, wear gloves when handling and wash hands after use. During handling avoid inhaling any dust or ingesting any of it. For a good conservation keep in a dry and cool place away from sunlight, weeds and contaminants. Store away from animals and children. Pre-order online with our Click and Collect option and collect your order from one of our 4 sites where this option is available. When you place your order you will be given a unique order number which you must bring with you, along with a form of valid ID, when you collect. Please place your order before 1pm Monday - Friday so that we can get them ready for you to collect the following day. Place your order before 1pm on Friday if you want to collect on a weekend. Orders placed on the weekend will not be ready for collection until the following Tuesday. Please be aware that local retail sites may offer discounts and promotions which are not available online. Order online and get Pro-Grow delivered to your home. Pro-Grow All Purpose Plant Feed 10 kg boxes are delivered within 5 - 7 working days. In order to give you the best possible value for money, orders of any more than 8 boxes may be delivered on a pallet. Pallets are delivered on a 7.5t vehicle and unloaded using a pallet trolley. If you order more than 8 boxes then you will need good access for a 7.5t vehicle and please be aware that the pallet trolley cannot travel across un-even surfaces (e.g. gravel). We will try our best to put the pallet where you need it but WE MAY ONLY BE ABLE TO DELIVER IT TO THE KERBSIDE. If you live in a countryside lane please mention on the checkout 'delivery instructions'.